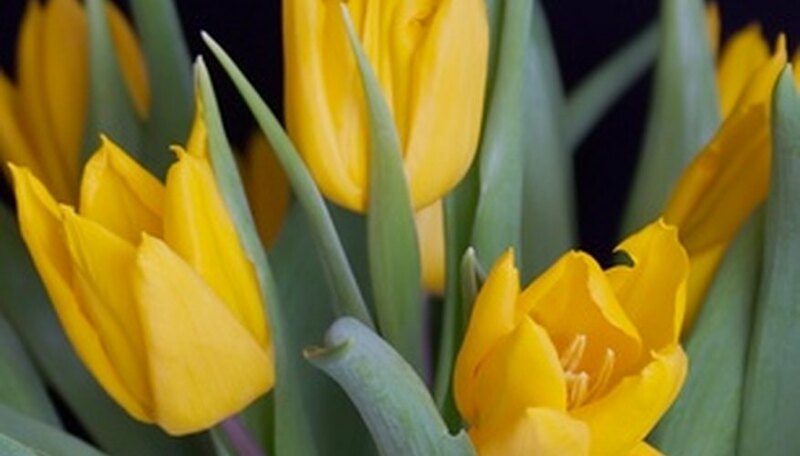 Flower bulbs spruce up the spring and summer garden with brightly colored flowers. The actual bulb houses everything the plant needs to create a flower once a year. Proper storage of bulbs during their dormant period allows the plant to regenerate. Learning how to save flower bulbs will ensure the plant produces beautiful blooms when set back into the flower bed. Allow the foliage to die naturally until the leaves reach a consistent yellow color. Bulbs grab nutrients from the foliage in preparation for summer dormancy. Do not clip green foliage or the spring bulb may produce fewer blooms when replanted. Use a spade shovel to dig around the dead foliage on all sides. Place the blade 6 inches from the dead center stems and step down to an 8-inch depth to remove a soil wedge. This placement eliminates the possibility of shovel damage to the bulb. Lift the soil wedge out of the ground and tip it sideways on a level surface. Use a trowel to lightly chip away at compacted soil to expose the bulb. Free the bulb from the dirt and brush away excess soil with a soft brush or your hands. Separate dead foliage from the bulb by cutting where leaves join the bulb. Place the bulbs on sheets of newspaper or on sections of cardboard in a cool, dry location to dry for 3 to 4 days. Transfer dried bulbs to labeled paper bags for summer storage. Add only enough bulbs to place a single layer along the bottom of the bag. Fold down the bag top and store in a cool location that features steady temperatures between 60 and 65 degrees F. This location should experience no humidity to limit potential bulb rot. Allow foliage to dry and die at summer's end. Dig around each stem at an 8-inch distance and lift the entire shovel full of soil out of the ground to limit shovel damage to the bulb. Turn the garden hose onto a light stream of water and rinse away the soil. Clear off all soil on all bulbs except gladiolus. These plants store better with existing soil compacted around the bulbs. Prune back foliage to the edge of the bulb. Place the bulbs on sheets of newspaper in a cool, dry location for 1 to 3 days. This location should feature cool temperatures between 60 and 65 degrees F and no humidity. Pour a 1-inch layer of fresh peat moss into the bottom of a cardboard box. Place a layer of bulbs onto the peat and add a 2-inch deep layer above the bulbs. Add a second layer of bulbs and cover with a 2-inch layer of peat moss. Avoid more than two layers per box since increased peat moss depth promotes decay of bulbs. Label the box for future reference. Store the box of bulbs in a cool, dry location with even temperatures between 60 and 70 degrees F.
Check the planting label provided with each plant to determine storage recommendations for each type of bulb.